I get a kick out of train rides. We’re really missing out in the U.S., I can tell you. 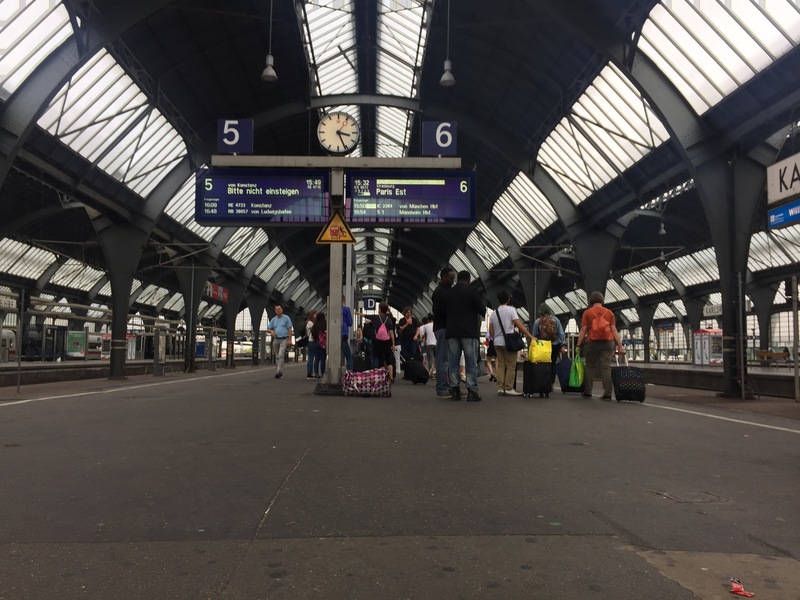 Some of us have ridden the Amtrak trains – I have on four occasions for somewhat lengthy trips and once more for a shorter ride – but most Americans don’t use the Amtrak system. It’s often too expensive and too slow for long-distance travel. Airplanes are cheaper and faster for the consumer. A shame. 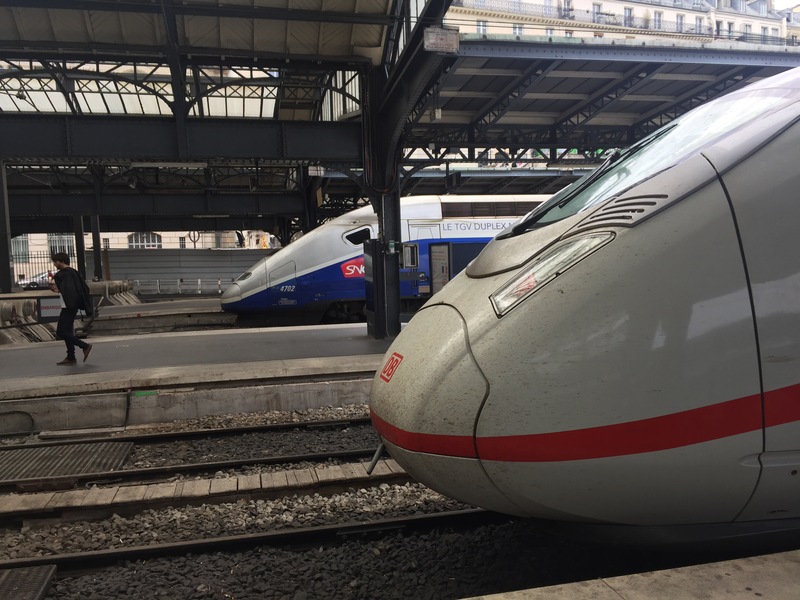 In Europe, though, travel by rail is extremely popular, quite a lot more convenient and comfortable than air travel, and is reasonably cheap (my first-class ticket from Berlin to Paris, a 9-hour journey, ran me a hundred euros; a coach ticket would have been perhaps twenty euros cheaper). The federally-supported rail companies are well funded and actually make money, thanks to their popularity among citizens and tourists alike. And it’s no surprise they’re so well-liked. get to my final destination in the city I’m visiting… instead of all that, I went to the main train station by a quick metro ride, boarded the train at one of about forty entry points in a casual order, found my spacious seat, made a workspace of my territory, and watched the world go by in comfort. Another metro ride in Paris took me to within a block of my hotel. I am fascinated by trains. 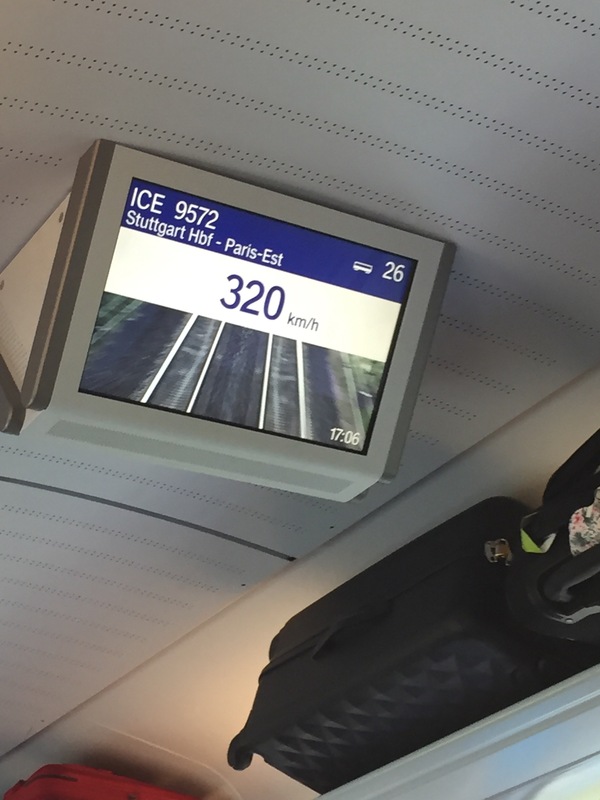 My Deutsche Bahn ICE (intercity-express) train clocked 320kph (about 145 mph) after entering France, and that is an intense speed on the ground. A little scary for the uninitiated (me, for instance). 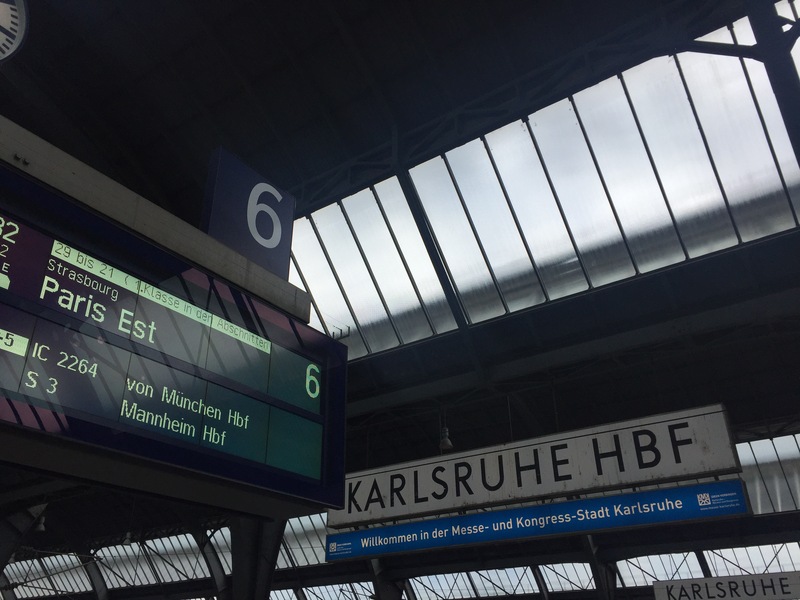 If we had such options in the United States, where trains are less comfortable, less well apportioned (the wifi is not so fast, reliable – and isn’t always even available – for instance) than they are in Central and Western Europe. Not all trains are created equally, however. Head east or south and, though the trains remain an easy and relatively cheap way of getting around, they are not quite so luxurious. In the Czech Republic or Italy, for instance, trains are often overcrowded for the space allotted per passenger and are downright old. I was shocked, for instance, back in 2011, by an experience on an Italian train (I expected it in the Czech Republic, where the same thing happened): when I flushed a toilet after use, I noticed something curious that caused me to flush again… and a third time. What I was seeing was that to “flush” a toilet was merely to dump its contents onto the tracks beneath – I could see the track and ground below every time I depressed the lever for flushing. How about that? Even in those places, the trains are fun and easy-ish to use (I’ve had some experiences where a stop on the train was not listed on the travel itinerary posted on the train’s windows and had to trust only the train identification number to tell me that I was headed in the right direction). They’re assuredly a step up from air travel, except in cases of extreme lengths of trips. In the United States, we’re not likely to see a change anytime soon. Because the industrial and passenger trains roll along the same tracks, the passenger traffic cannot outpace the industrial traffic. Otherwise, you know… kablooey. So 55 mph is the maximum speed on U.S. lines, as I understand the circumstances. To get faster trains, we’d need to build entirely new rail lines. Good luck with that in a country that has little use for the existing system and regularly debates whether or not to fund Amtrak, which loses money in many years, at all. 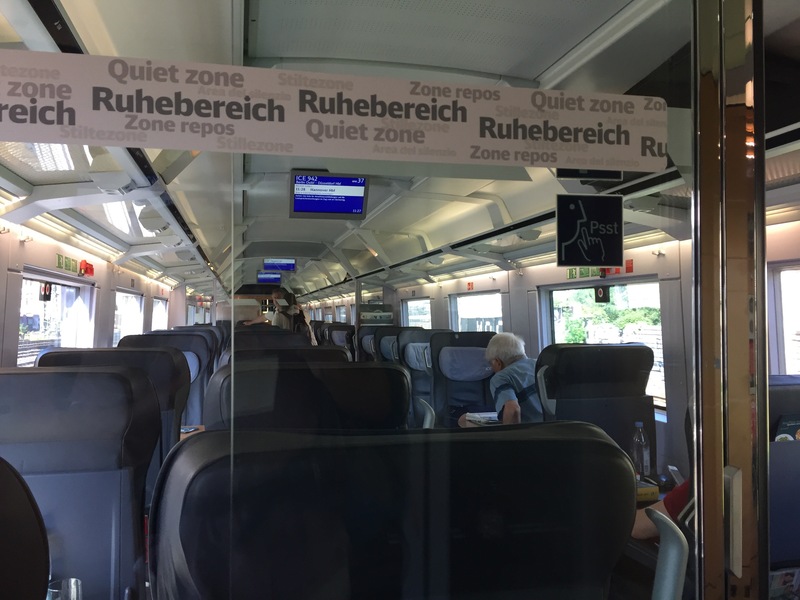 Tips for using the European railways: I used to hear a lot of noise about the Eurrail Pass permitting many trips on a single ticket; unless you’re a student riding trains every single day, do not bother. The passes do not provide seat reservations, which must be made at stations prior to each trip, and every time I’ve compared the cost of booking individual trips + reservations to purchasing a rail pass, I’ve found that the individual bookings are a lot cheaper in sum. This held even when I was traveling approximately twice a week between German cities or between Czech and German cities. In addition, to save money, always book your trip on the railways’ sites directly – not through the Eurrail site. What Eurrail charges is not exorbitant, and if you’re doing a lot of travel, they can group all of your tickets together and send them to you in a neat little package; but generally, you’re better off just going directly to the national rail websites for whichever countries you’re visiting. Remember to visit the 2017 travel page to see every post I’ve made this year (Amsterdam in April, seven countries over the summer). This entry was posted in Travelogue, Travelogue 2017, Travels and tagged backpacking, Central Europe, comparison to USA, Culture, Czech Republic, eastern europe, europe, europe by rail, european travel, France, germany, Italy, rail travel, Slow Travel, trains, travel, traveling, Western Europe. Bookmark the permalink.